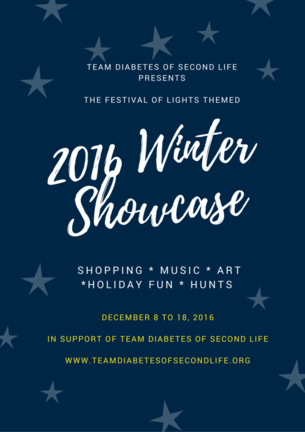 The Team Diabetes of Second Life 2016 Winter Showcase and Art Show opens its doors on Thursday, December 8th, and runs through until Sunday, December 18th. It will include ten days of live performers, DJs, concerts, tribute acts, hunts, ice skating, ice fishing and, of course the Winter Showcase and the Kultivate Winter Art show. All to raise money for the American Diabetes Association (ADA), through Team Diabetes of Second Life, ADA’s official and authorised in-world fund-raising team. The 2016 Winter Showcase is sponsored by Chop Zuey Couture Jewellery, Ghee, and Potomac Signature Homes and features the following brands: *DBS* Designs By Soosy, alme., Balderdash, Becksley Shoes, Black Rose Designs, BYRNE, ChiC buildings, Chiffon, Chop Zuey, EED Home&Garden, Emerald Couture, Feyline Fashions, Gee, Ghee, Get Jiggy!, Giulia Design, IC From Within, IT! (Indulge Temptation! ), Kitty’s Claws, Le Fashion Wh*re, Lillou Merlin Design, Mahlberg Tailors, Mara’s Mysteries, Miss Darcy, Mousies Family Store, Park Place Casuals, Park Place Home, Pink Ice Boutique, Potomac Signature Homes, Romance Couture, Sophisticate, Sonatta Morales, Spyralle, Steelhead Outfitters, Stone’s Works, Sweet E’s Designs, TASHI, Tayren’s Fantasy Fashions (TFF), The Gold Club, TRS Designs, Vengeful Threads, Whimsical Happenings, Winterwood, & Wood Works. The Showcase occupies the west side of the region, with stores arranged around a central square offering seating – including a chance to sit on Santa’s lap! The events area can be found on the north-east side of the region, alongside the Kultivate Winter art show. Sponsored and produced by Kultivate Magazine, the Art Show features the following artists and photographers: Aradia Aridian, ArtemisGreece Resident, Bamboo Barnes, Bryn Oh, Brynedarkley Cazalet, CalystiaMoonshadow, Catalina Staheli, Cica Ghost, Cubito Smit, Eleseren Brianna, Eucalyptus Carroll, Giselleseeker, Hana Hoobinoo, ilyra chardin, iSkye Silverweb, Jamee Sandalwood, Johannes1977 Resident, JolieElle Parfort, JudiLynn India, Kaijah Chrome, Kayly Iali, KodyMeyers Resident, Layachi Ihen, Lucia Tophat, Lulyboop Resident, Miele Tarantal, missabstract Resident, Myra Wildmist, Pam Astonia, Paradox Messmer, Ramsa Luv, Rosy Highwater, Roxanne Fayanucci,Sabine Mortenwold, Sandi Benelli, Sheba Blitz, Silas Merlin, Slatan Dryke, Sparkie Cyberstar, Tisephone, TriplePlayNitely, Veruca Tammas, Warm Clarity, Wintergeist Resident, & WrenNoir Cerisse. Sunday, December 18th, 13:00: a special winter fashion show organised by Models Giving Back where participating merchants will show off their winter fashions and creations. Team Diabetes of Second Life is an official and authorised fund-raiser for the American Diabetes Association in Second Life. Established with the aim of raising funds in support of diabetes treatment and to raise awareness of the disease in SL, Team Diabetes of Second Life was founded by Jessi2009 Warrhol and John Brianna (Johannes1977 Resident), and is served by an advisory board comprising Eleseren Brianna, Veruca Tammas, Sandie Loxingly, Rob Fenwitch, Earth Nirvana and Dawnbeam Dreamscape, with Saiyge Lotus serving as a special advisor. Note; SLurl to the event may not be available for public access until the event opens on Thursday, December 8th. 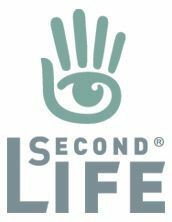 As per my coverage of the increased LI allowance across Second Life (see here and here), the Lab announced the availability of an additional 10K LI for full private regions on December 7th, 2016. The recent LI increases represented, on average, a 33% increase across regions. now – as announced in Upgrade Your Full Private Region to 30,000 Land Impact Today! – owners of FULL private regions can increase their LI allowance by a further 50% – taking them from 20,000 to 30,000. There is a one-off upgrade fee of US $30 applicable to each Full region being increased to 30,000 Land Capacity. There is an additional monthly maintenance fee applicable to each updated region. This stands at US $30 per month at the time of writing, but please refer to Land Impact Change in the Managing Private Regions Knowledge Base article for current fees. The upgrade must be maintained for a minimum of one calendar month. Downgrading to 20,000 Land Capacity will incur a further one-off charge of US $30. No pro-rating or discounts are permitted with the upgrade. In 2014 I, like many other Second Life users, paid my first visit to Frisland, the region designed by Charlie Namiboo, Anna Barzane and Frislanda “Fris” Ferraris which was based on the phantom island that appeared on virtually all of the maps of the North Atlantic from the 1560s through the 1660s. The region became an instant hit with visitors, changing its face to match the seasons, and drawing people back time and time again. So much so, that when it did finally come time to say goodbye, it was obvious many would miss it. It seems that Charlie and Fris also found it hard to leave their beloved creation behind, because they’ve just opened up Fris’ Land. While in no any way intended to be a replica of their original vision, it nevertheless offers those of us who miss Frisland with the opportunity to recapture memories of its wintertime look. Occupying the eastern half of a Homestead region, Fris’ Land presents a snowbound landscape in which familiar pieces from Frisland – the little church, the horses and their little barn, the deck sitting over frigid water – sit alongside barns and houses not seen with the original, offering as new setting to explore and enjoy. From the landing point, located near a large barn offering indoor seating, complete with pot-bellied stove and fireplace to ward off the cold, visitors can wander north or south across the snow, to where either the little red church sits at the north end of the region, or to where a large timber-frame house occupies a study wooden deck on the southern side. Along the walk to the church, visitors will pass a small deck extending out over the waters between the islands, chairs arranged alongside another pot-bellied stove, just as they did in Frisland (do, as well, keep an eye out for the little black kitten on the deck – he’ll certainly be keeping both eyes on you!). When heading south, be sure follow the stone-line track which meanders past the horses and their hay shed. Throughout the region, there are plenty of places to sit, indoors and out, including an old greenhouse frame sitting on a small dock behind the main barn. However, when exploring, and while there are bridges leading to them, do please keep in mind the island to the west are private residences, and not open to the public. It’s a delight to see Fris and Charlie sharing their creativity again – and my thanks to Charlie for sending the invite for us to visit. Firs’ Land will remain open for “a couple of months” – so enjoy it while you have the chance!